Welcome to the end of the day! 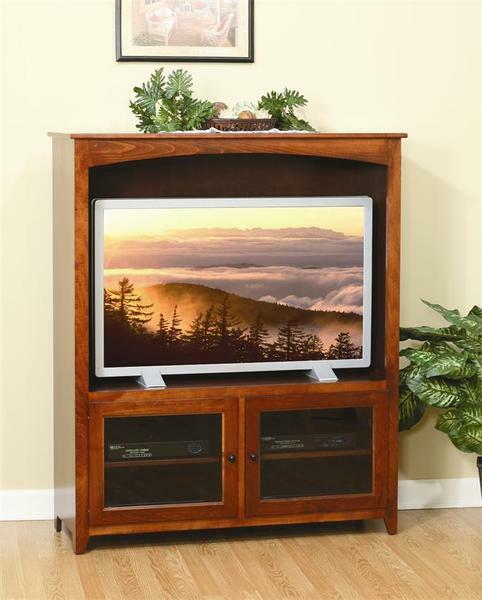 The Amish Economy Entertainment Center with Glass Doors is Amish made in Ohio and is ready to host your evening TV time. Choose oak or brown maple wood for this storage and display center that measures 60" high, 50 1/2" wide and 18" deep. This entertainment center is shown here in brown maple wood with Acres stain. This entertainment center has a build time of 2-3 weeks, a fast build time for solid wood furniture. Enjoy adjustable shelving, the option to add soft close doors, and the beauty of solid wood furniture right in your living room or den. Call us today with any questions. We thank you for shopping at DutchCrafters. order from you again. Thank you.